When your country’s facing economic turmoil, who you gonna call? 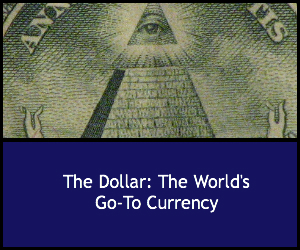 For worried consumers around the globe, the obvious answer is the trusty US dollar. Just ask the Russians. As Russia slides deeper into economic crisis, dollars are in high demand, followed by the euro. That leaves the country’s own currency, the ruble, far behind. As a recent article from Business Insider reports, the Russian economy has taken heavy hits lately thanks to unrest in Ukraine and the looming threat of sanctions imposed by an international community outraged by Russia’s handling of the crisis. The ruble has taken a drastic fall in international markets in recent months, trading at 80 to 1 against the dollar and 100 to 1 against the euro. And that has Russians ranging from the humblest shop workers to well-off oil industry insiders scrambling to get hold of dollars any way they can. Some are buying up dollars whenever possible. Others are withdrawing their money from local banks in dollars, depleting supplies and forcing banks to require pre-orders on dollar transactions. And while many banks are running short on dollars and euros, there’s no shortage of rubles on hand. The situation in Russia mirrors similar events in other countries where national economic crises and debt-related collapses make the local currencies unstable and unreliable in international trading. Conditions like those make more stable foreign currencies much more desirable. The recent financial crisis in Argentina sparked fears about the country’s economic stability, too. And the country’s bustling currency black markets were overrun with requests for dollars. Small countries in poorer areas of the world, too, turn to the dollar to boost international trade and foreign investments. The same factors also drive offshore banking and investing, as people take steps to protect their assets from turmoil at home. Safeguarding assets from local economic crises is a leading reason for the surge of foreign investing in US real estate. Well-off foreigners from countries such as China and India see US property investments as secure places to protect savings and business assets. The quest for a stable currency in a chaotic political and economic situation nearly always leads back to the dollar. The euro runs a close second in world demand, for much the same reason. Though it has a shorter history, the euro is the product of a stable economic union; most of those members have a track record of stable and peaceful governments and economies. That search for an internationally viable currency that’s not tied to local banks has also fueled the popularity of the Bitcoin and other digital currencies in many parts of the world, particularly Latin America and Asia. Those cybercurrencies are generated and traded entirely online, without the backing of traditional banks. They’re recognized virtually everywhere and can be exchanged in a variety of online markets and even local businesses, which appeals to consumers who don’t trust their local currencies. But those currencies have their own problems. Their value can fluctuate wildly in international trading and their use has been outlawed in some countries. That leaves the dollar alone at the top of the world’s list of go-to currencies. The venerable greenback has taken its share of knocks in world trading in recent years, thanks o the massive housing collapse of 2008 and the economic struggles that followed. But its stability and security can’t be denied. Backed by a stable government and a solid central bank, the dollar dominates international trade and lending. Dollar denominated debt drives borrowing and lending among nations, too. Many countries keep a reserve of foreign currency available for managing their debt. That’s another hedge against instability in the local currencies, which would make it impossible to manage those debts. And, as in Russia, the dollar is the primary currency of choice for those foreign reserves. Holodny, Elena. “Russians Are Scrambling to Get Their Hands on US Dollars.” Business Insider. businssinsider.com. 16 Dec 2014.